The tills of shopping centres in the north and north-east were jingling yesterday as customers rushed to get last-minute Christmas gifts. 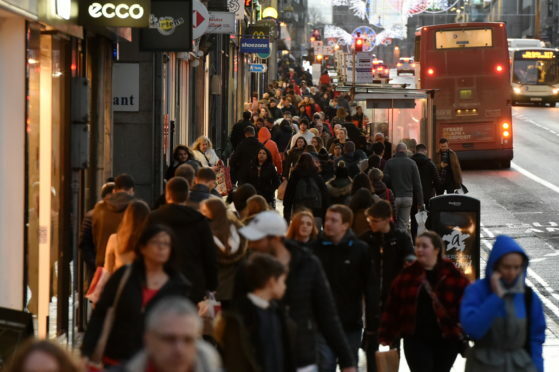 Retail outlets in Aberdeen were packed throughout the weekend, despite the wet weather on Saturday, and thousands are expected to pass through their doors again today. The Bon Accord Centre was “buzzing” yesterday as shoppers piled through its doors. General manager Craig Steven said: “There has been a real Christmas buzz in the centre during the last few weeks. “The footfall has been tremendous especially given the horrible weather we had on Saturday. Looking back on recent years, Mr Steven said he thought this year “seemed busier” and is expecting the crowds to thicken further over the next few days. The centre will re-open on Boxing Day and queues are expected to build at the Next sale from early morning. The shopping rush was not consigned to Aberdeen, with large crowds also flocking to shops in Elgin. Elgin BID chief executive, Gill Neill said she hoped many of the shoppers were heading to one of the town’s independent retailers, adding: “I think some shops are still struggling to compete with online shopping – but it is important to remember that you get a completely different service on you high street. “Elgin has a fantastic mix of small independent retailers – they all have that unique factor. Shopping should be like a day out; go for a coffee, lunch and browse the shops.